All I can say is this is 100% cute and I want it! 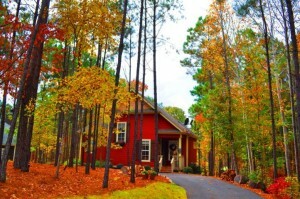 If you ever thought Lake Martin living was un-affordable, you need to visit this Cabin in the Village! Incredibly Unique with style, fashion and a little bit of country!From its over sized deck that looks out at peaceful hardwoods and a playful private backyard to the comfort of a great room with a cozy rock fireplace! This custom built cabin is gifted with windows, open area while still compact enough for easy cleaning and upkeep! Landscaping lights, storage under the decks, custom built gardens, outdoor grilling area, river rock retaining walls, wood ceilings and floors. plus so much more! Plus being in the Village you have access to a computer room, fitness area, free trailer storage, boat ramp, common docks, private trash facility, underground utitlites, private Chapel, Two Pools and much more!!!! Click Here for awesome photos and details. Call Michael Langston 256.750.5200 for your private showing! Home Sellers of Minnesota, Inc.
Amy Clark Real Estate, Inc.